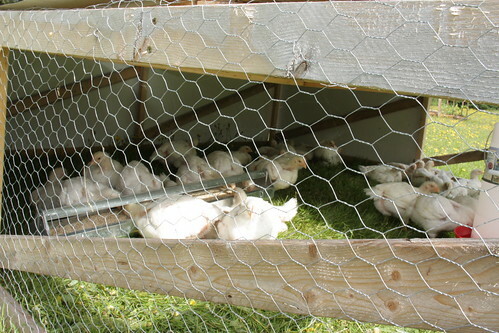 The biggest news is with the chickens – they are finally outside in their pen!!! It has been a real killer trying to get the pen finished. Had to cut the roofing by hand, trim off the edges, and re-staple a bunch of the wire. The problem has been that the bugs are back in full force, and I have been eaten alive every single time I go outside. It makes work very, very difficult. The other big problem has been with the wheels. I was unable to figure out how to make a proper dolly as outlined in the book, and have been struggling to make wheels that could fold down and then stay in place. In the end, it’s still not working properly. I managed to get the pen over to a starting position (more headaches) and the birds are in. Hopefully I can get some help from the internet and/or friendly neighbours. It has been a chore. Finally the birds are starting to show leg issues; they can all still walk but I’m getting quite worried that they are growing too quickly. All in all, it’s been a difficult week chicken-wise, and it’s a small victory to finally see them outside. We are looking at four days of rain, so I think my next task is to find someone I can buy hay from. Whew! The garden has started to grow and the tomatoes are taking to their new home quite nicely. 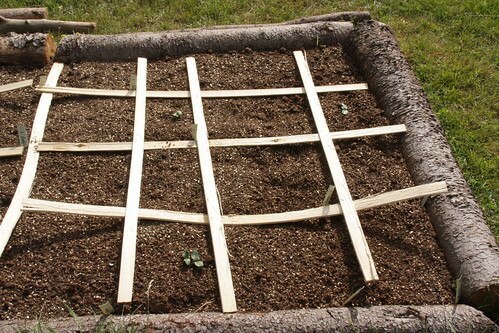 I decided to take the row covers off for a few days to see what happens; we’re supposed to be getting rain and I think it might do them good. If it gets too heavy, I’ll put the covers back on. Last, but not least, the wine is mellowing away in the basement. It had to stand for three days and then go on its side (something to do with the cork). 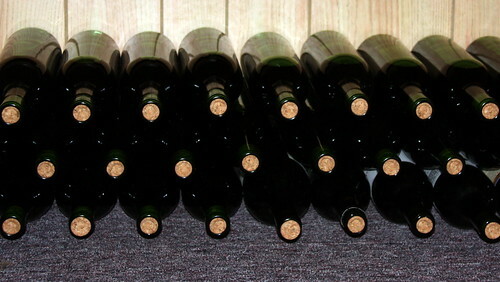 So far it looks like all the bottles were sealed properly and now it’s just a matter of time before the tasting. Using a manual corker is a surprisingly good workout! Who would have thought that squeezing a cork into a bottle would require so much pressure. 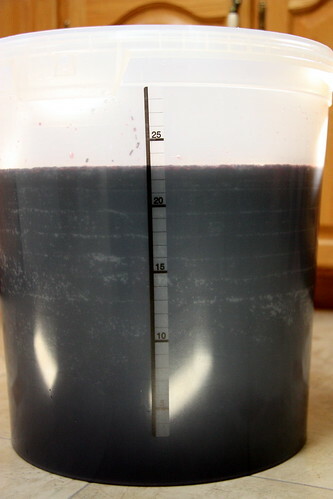 The wine still looks like grape juice; hopefully in one or two months it will start to look more like real red wine. 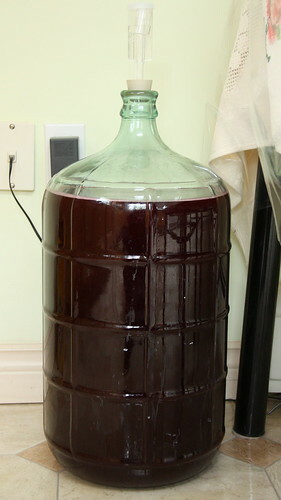 Racking (transferring wine from plastic tub to huge glass bottle) involves siphoning - something I have never done before. I had three false starts (where the wine stopped moving after a minute or so), about twenty failed attempts, and then finally figure out that you almost certainly need to get a bit of wine in your mouth before it starts flowing properly. Needless to say, I can now get free gas any time I’m short on cash. As part of becoming more self-sufficient and ensuring that the food (and drink) being consumed comes from a good place, I’ve decided to try making some wine :) A Cabernet Sauvignon, to be exact. 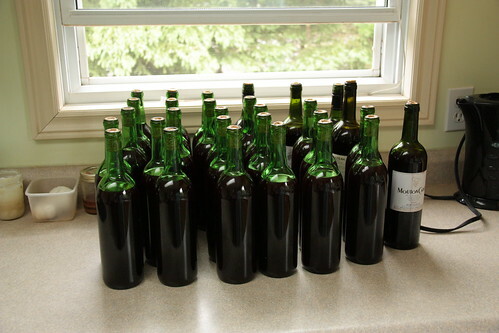 It takes four to five weeks before it’s ready to bottle, and then 1-3 months after that before tasting. This was fairly simple (although it looks like all the stages are simple). 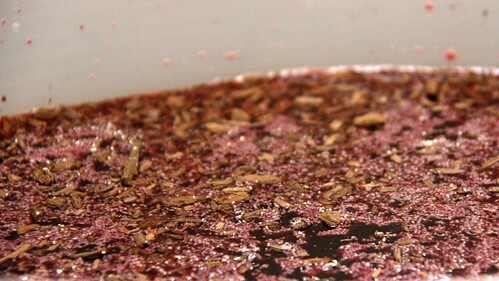 Sterilize the equipment, dump in the grape juice, water, oak chips, and some dirt (bentonite). They are Very Clear that you must make Exactly 23 litres. Finished around 4:30pm on Thursday. Now we play the waiting game .. for 5-7 days apparently.